Salar de Uyuni is with 160 km length and 135 km width the largest salt area of our world at an altitude of approximately 3700 meters. 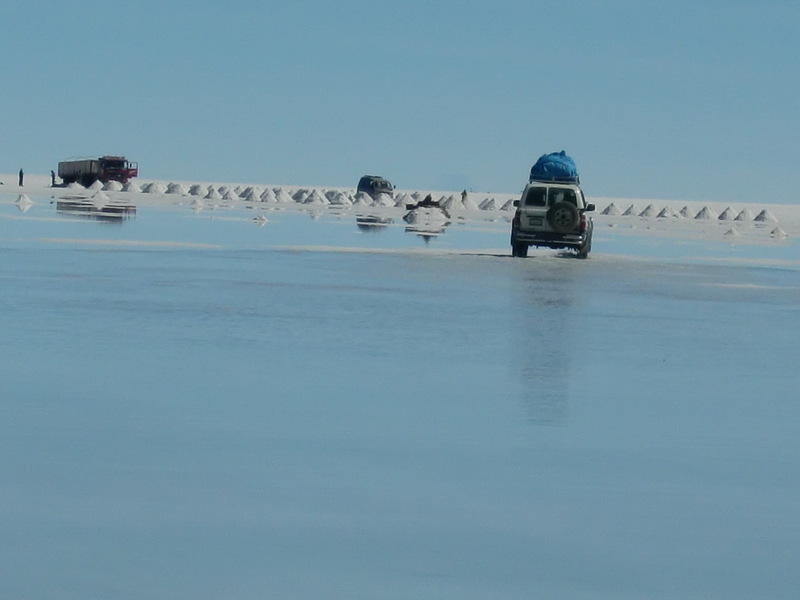 The salt is between 2 and 7 meters thick, so it can be accessed by 4x4 cars if there is not too much water. 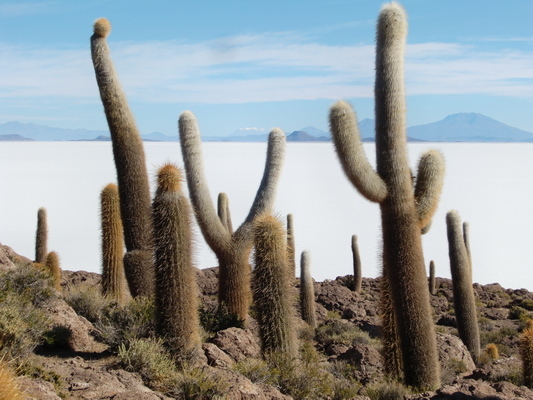 In the rainy season between December and March the Salar de Uyuni becomes a tremendous huge mirror. The water dries in the following months more or less, so the surface becomes totally white. The Volcano Tunupa is situated on a peninsula of the Salar de Uyuni and provides fantastic views to the Salar because it overtops the Salar de Uyuni more than 1500 meters. 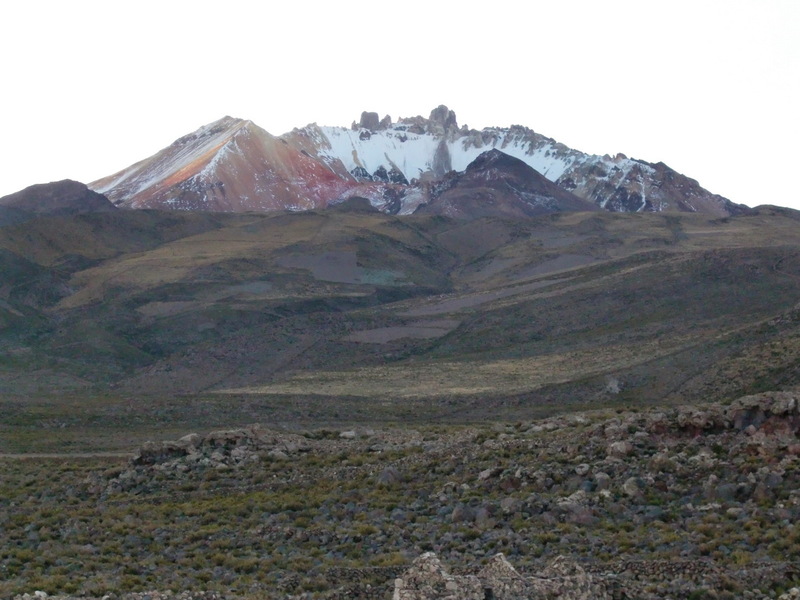 Due to its outstanding location the Volcano Tunupa is a holy mountain of the Aymara people. 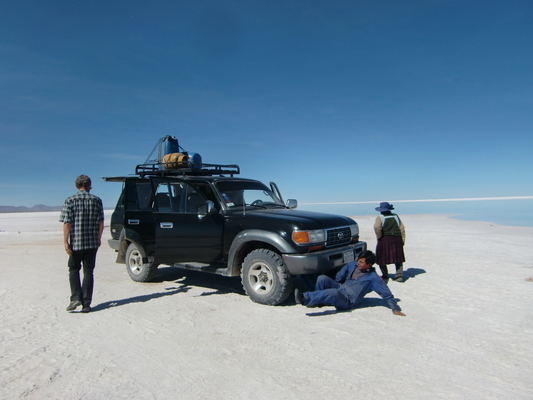 We came to Bolivia in the evening of May 24th 2011. The first town Villazon is a typical border city - mainly a shopping center for Argentina. We continued the next day to Tupiza, a pleasant town in a nice valley surrounded by rocky mountains. 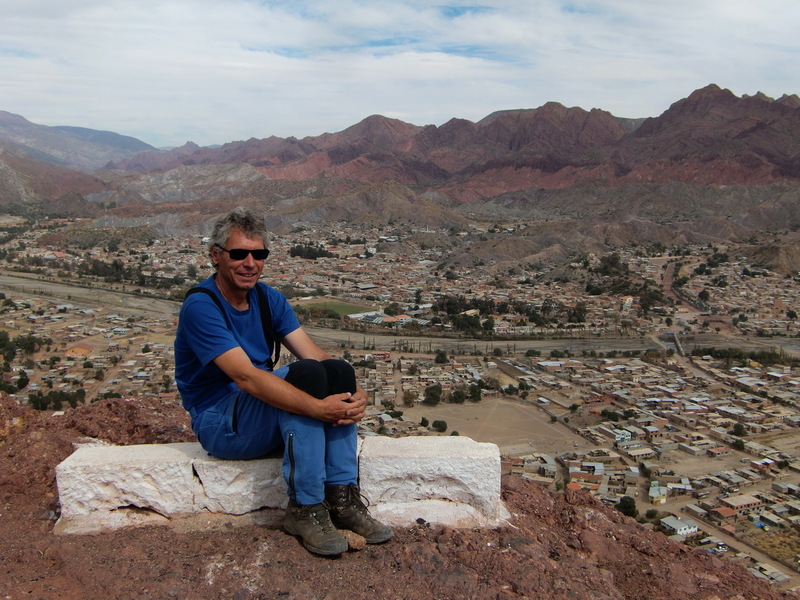 We climbed up the striking Cerro de la Cruz, 3211 meters high. There is a good path starting in the northern part of the town, direction Potosi. 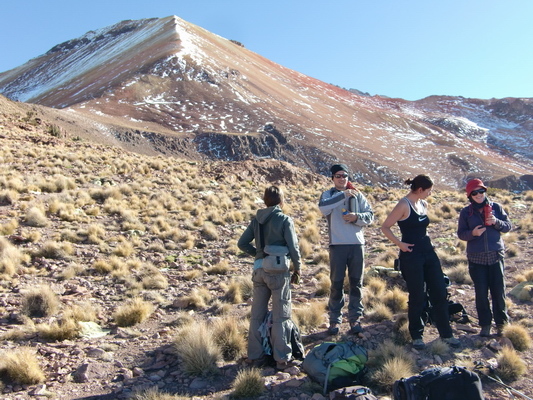 The summit provides marvelous views to Tupiza and its environment (GPS coordinates: S21° 25.762' W65° 42.811'). 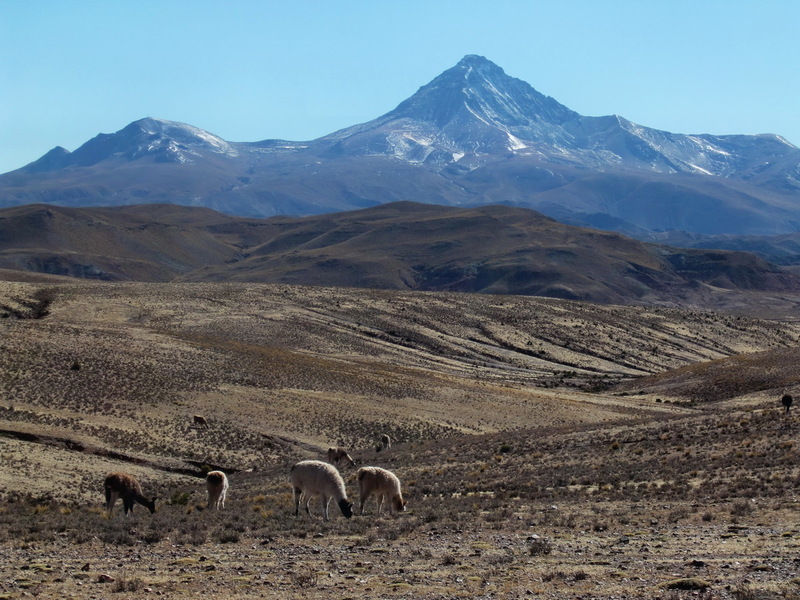 In Tupiza we decided to make a five day tour with the agency Licancabur: The Salar de Uyuni with the Isla Pescado, Volcano Tunupa, Volcano Uturuncu and Laguna Colorada. 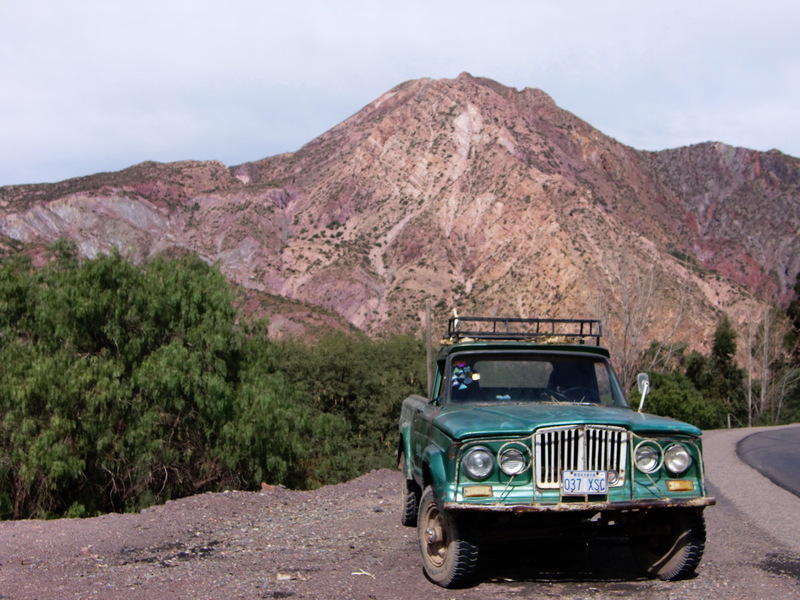 Included in this tour was a Toyota Landcruiser, the driver, all food and accommodation. This tour is impossible with our VW California, because a 4-wheel is mandatory due to the bad roads and river crossings. 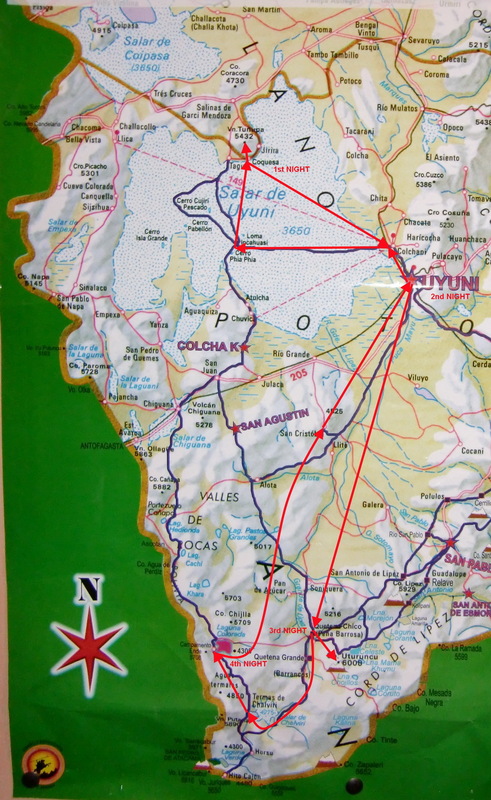 First we had to drive the next day to Uyuni, just 230km away but mainly not tarred. We drove nearly the full day the dirty and dusty road, but we had outstanding views. 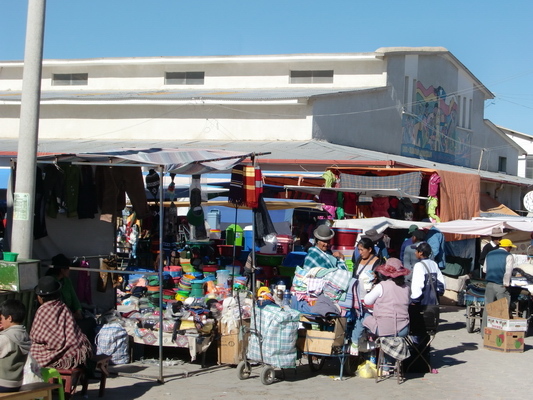 There was the weekly market for the local people, when we arrived in Uyuni. Astonishing many different commodities were offered like ghetto blasters, all kinds of screws and deodorants, clothes, jewelry... .
We rechecked our 5 day tour in the local Licancabur office and agreed with our driver Obet that we start tomorrow at 9:00AM. 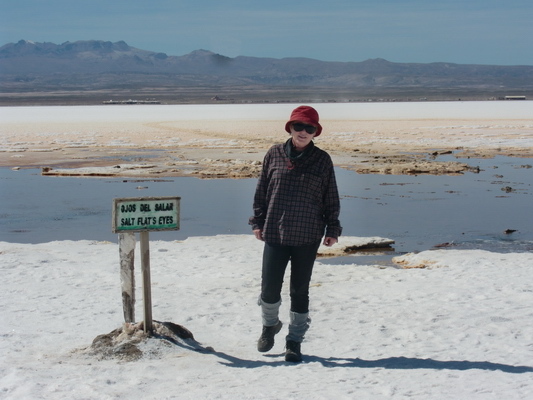 The only difference to the tour package we had booked in Tupiza was that we come back to Uyuni on the second day because it was not possible to cross the Salar de Uyuni from North to South due to too much water on the salt. We were a little bit surprised when we started our trip the next day, because besides our driver Obet a second person from the agency joined us: Fronia, our cook. 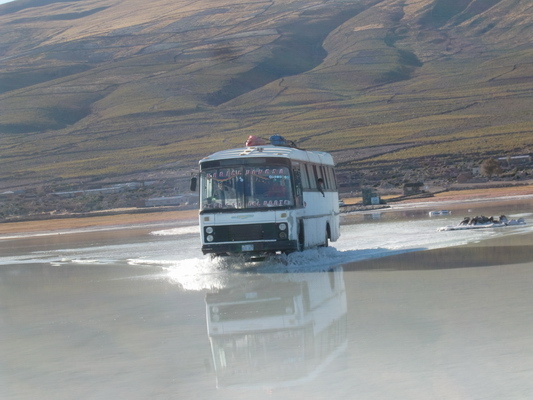 Soon we arrived at the banks of the Salar de Uyuni - a lot of water had to be crossed to achieve the salt! Obet prepared our car with plastic blankets for the salt and salty water. 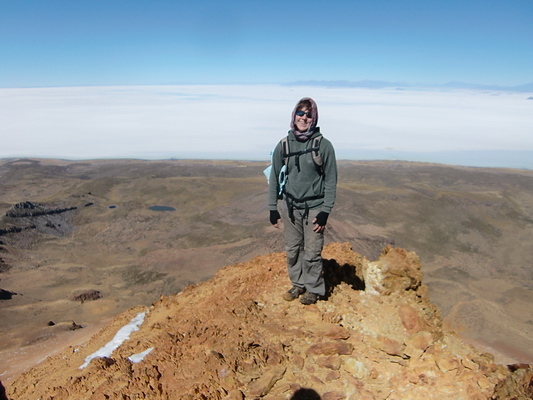 After crossing the water with a weird stomach feeling, we arrived soon at the Ojos del Salar - Eyes of the salt lake. 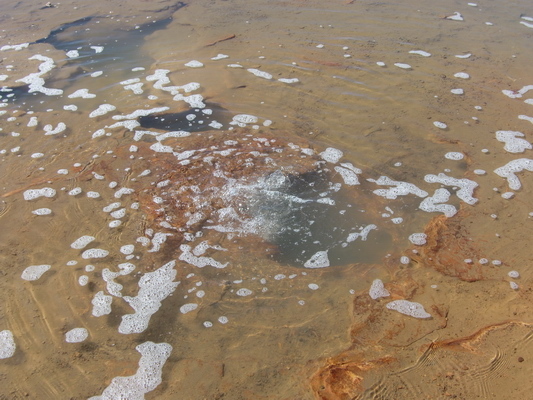 These were holes in the salt due to warm and bubbling water. Again we became a strange stomach feeling - be careful that you do not break in! 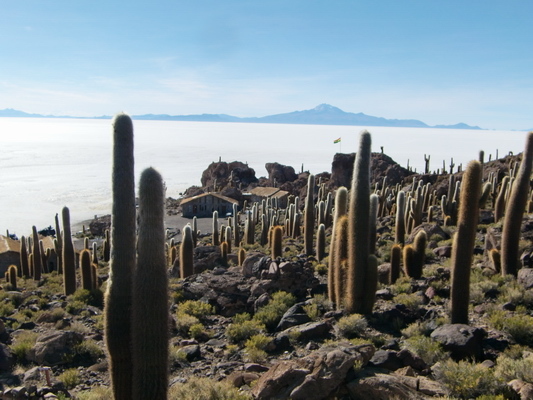 Our next destination was the Isla de Pescado (Fish island due to its shape) or Isla Incahuasi (House of the Inca), which is situated more or less in the middle of the Salar de Uyuni. 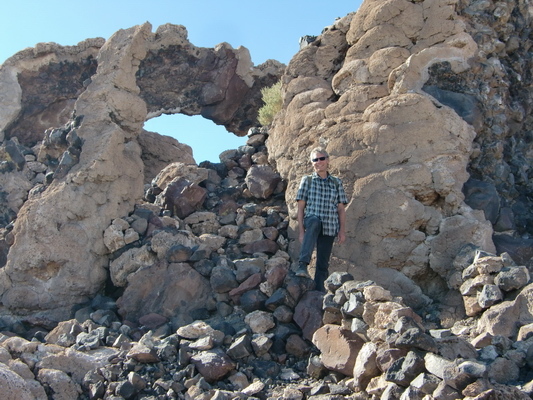 This island has a volcanic origin, like the Salar. A lot of high cactuses are growing on this island and a colony of Vizcachas (the rabbit like chinchilla), which are isolated from the main land. The Isla de Pescado is a National park; consequently you have to pay some cents for the entrance. 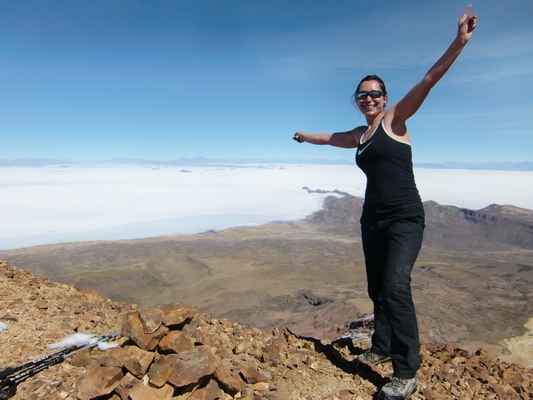 There is a path to the highest point of the island, where you have a wonderful view to the Salar de Uyuni and its surrounding mountains. Another attraction of the Isla de Pescado is the Ventana de Corales - the coral window. After we returned from our little tour through the island we got a delicious lunch from Fronia. In the late afternoon we arrived at the North shore of the Salar de Uyuni in the village Coquesa on foot of the Volcano Tunupa. Again we had to pass deep water. We were staying in the hostel Tunupa in Coquesa. It is like the Salar de Uyuni approximately 3700 meters high. To gain the 5207 meter high Volcano Tunupa, you can drive with 4.wheel car up to 4000 meters to an ancient cemetery - still a long trip to the summit. We confirmed with Obet that he drives us the cemetery the next morning at 5:30AM, just a half an hour drive. We met two Austrian Ladies, Bernadette and Johanna, and a man from Spain, Manuel, in the hostel. They had hired a guide and they want to start from the hostel already at 4:30h, because it is 1.5 hours more than from the cemetery. It should be the first mountain for Bernadette, Johanna and Manual with an altitude higher than 5000 meters. They were so excited. Before dinner we explored the village Coquesa and we had stunning views to the Volcano Tunupa. Accessible with acceptable risk is the 5207 meter high western peak, because the way to the central summit is extremely dangerous due to very steep and loose scree, and rotten rocks. After our exquisite dinner we went early to bed. There was music and singing in the background, because it is Mother's day in Bolivia. But we fell asleep soon. On the next morning, we saw the two Austrian Ladies and the Spanish man a little bit perplexed sitting in the dining room. They had woken up as planned at 4:00AM, but no guide had appeared. Manual knew where he was sleeping, but he was so drunk that he could not manage to upraise. Fortunately we had enough space in our Toyota Landcruiser, so we started the ascent to the Volcano Tunupa together. But when we wanted to leave the village the gate to the cemetery was locked. Our driver Obet honked several time but nobody appeared, thanks to the fiesta the previous day. He drove through the whole village to find somebody and finally an elderly Lady came. She directed us to a house, but still nobody appeared. We drove back to gate determined to break the lock. But the bar of the lock was just leaned! In the end we arrived around 7:00AM the cemetery. First the way to the Volcano Tunupa was very clear to a saddle. 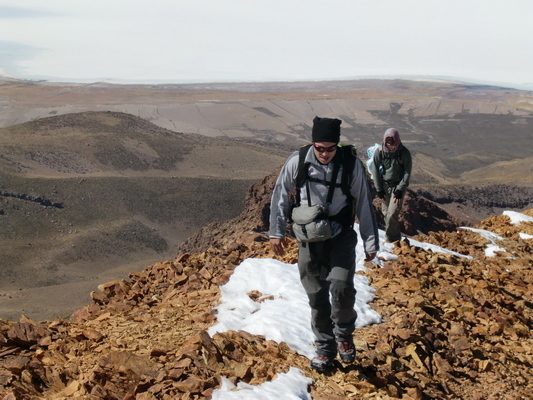 It became serious after the saddle, because we had to climb up in nasty, steep and loose scree. But everybody managed this critical section and we achieved the ridge, which was covered with some snow. Fortunately the snow was very comfortable, a little bit soft. Finally we had to do an unpleasant crossing in the left side of the ridge. Marion decided to return and to wait for us in the saddle. After the ridge a flat and broad crest directed us to the summit, which we achieved on May 28th 2011 at 11:30AM (GPS coordinates: S19° 50.464' W67° 38.748'). 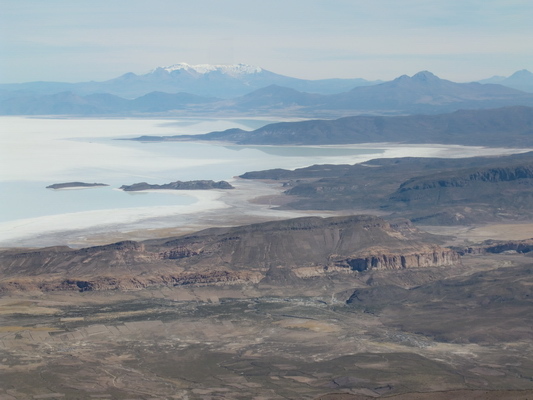 The views were overwhelming, especially to the Salar de Uyuni with its islands and to the central peak. And the weather was fantastic: Very warm and no wind. We stayed more than one hour on the top. Everybody was happy but also a little bit worried about the descent. 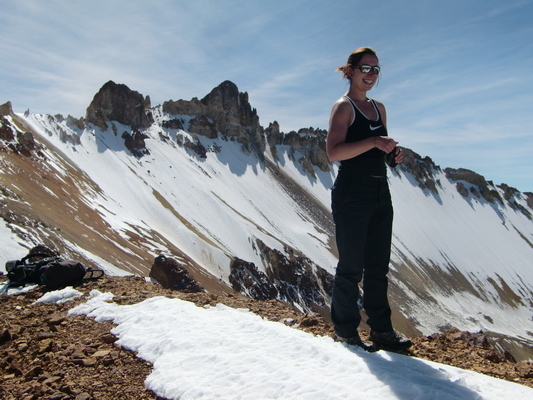 The descent was much easier than expected: We could drive down the snow and scree like snowboarding. Soon we were back in the saddle and two hours later we arrived at the cemetery, where Obet was waiting for us. The newly 5000er conquerors came with us to Uyuni. Somehow Obet managed the entire luggage and 7 people in the Toyota Landcruiser. We arrived very late in Uyuni, it was already dark. We dropped Bernadette, Johanna and Manual at the bus station, because they wanted to catch a bus to La Paz. Afterwards we brought Fronia home. When we unloaded the car at our hostel, we got a shock: Alfred's big backpack with our passports was disappeared. This backpack was on the roof of the Toyota and was taken down at the bus station. We drove as fast as possible back to the bus station. Indeed Bernadette and Johanna were waiting for us, sitting on the missing backpack. Jesus, we were really very lucky! 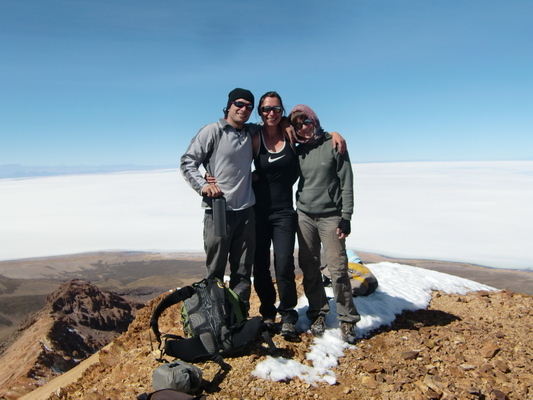 Thank you so much Bernadette, Johanna and Manuel, also for the wonderful tour to the Volcano Tunupa! They expected us and were also happy, because some of their boots were still in the Toyota. Everything was in order.